Roughingoperationwithtitanium: without Safe-Lock™ thetoolpulled out ofthestandardshrinkfitchuck andbroke at ap= 2 x D.
With HAIMER Power or Heavy Duty Chucks and Safe-Lock™ it was possibletoreliablymillfullslotsatap = 2 x D.
Especially within the aerospace, energy and mechanical engineering sector, production managers have to bridge the gap between economic efficiency and high process reliability when working with materials that are difficult to machine. Fortunately there is peace of mind in knowing that the machine technology innovations continue to develop to meet the ongoing demands of manufacturing.Heller machine tools is known as a source of inspiration for these kinds of innovations. The company, located in Nuertingen, Germany, is known for its high quality 4 and 5-axis CNC machining centres, CNC mill/turning centres, CNC machines for crankshaft and camshaft machining as well as flexible manufacturing systems. Customers value their availability of products and their competency in managing special processing demands. Both qualities stem from Heller’s in-house manufacturing, which relies on closer collaboration with customers, suppliers and researchinstitutes to remain on the forefront of innovation. Werner Kirsten, who is working in the Technology Development Department at Heller and is responsible for the area of "difficult to machine materials“, explains: "our service includes optimizing the machining processes together with our customers and suppliers. To support such services with practical trials, our Technology Center is equipped with a variety of machines". In most cases the aim is to increase the productivity without compromising the process reliability. Technologist Kirsten adds, "We often achieve this aim with an optimized roughing operation which ultimately results in a reduced finishing process. By maintaining the same technological values, but shortening the finishing depth of cut by 50%, the overall machining time is reduced to half. However, this requires process reliable and controllable systems during roughing." In this regard,all machining components in the process chain have to be considered in order to improve productivity. The machine tool is the most evident component of the machining process, however the tool, the tool holding system, the coolant supply and other elements are also essential for a successful operation. "In the end the weakest link of the process chain limits the success," Werner Kirsten emphasizes. In his opinion most machine shops don't pay attention to the tool holder even though it is especially significant for high performance cutting. "Many of the trials which we carried out during the last few years have proven this point", Werner Kirsten explains. We realized that the tool holder hasan incredible influence on the machining process. In the case of reinforced shrink fit chucks, for example, the vibration node is closer to the bearing point (due to the larger mass). The result is a smoother machining process with less vibration and a better surface finish quality while using the same tool, machine, process parameters and fixturing technology." When a group of representatives from the aerospace industry, the Technical University of Dortmund and Technical University of Hamburg-Harburg visited Heller,an especially extensivemilling application study was conducted in Titanium Ti-6AI-4V. The available machining center was a four axis Heller H 5000 with a gear unit and HSK-A100 spindle, which yields torques up to 2.290 Nm. In order to demonstrate the machining potential, different 25mm diameter end mills were used to mill full slots into a titanium plate. To simulate holder conditions used in the aerospace industry, the tools were clamped into reinforced shrink fit chucks. At an axial cutting depth of0.5 to 1.0x D the machining process was found to be very reliable. Since the spindle was not running at full capacity, the trial participants agreed to increase full slottingdepth to 2 x D. Werner Kirsten explains: "Under these conditions the tool pulled out of the shrink fit chuck during the machining operation, creating a slot closer to 2.5xD as it progressed through the part. Towards the end of the slot the tool finally broke as a result of increased cutting forces." Werner Kirsten got in contact with HAIMER, the European market leader for tool holding technology, in order to test the Safe-Lock™system: "we wanted to know if our ideas could be put into practice using the HAIMER system in an even less forgiving environment." The Heller technology developer repeated the described trial,with a few major changes. 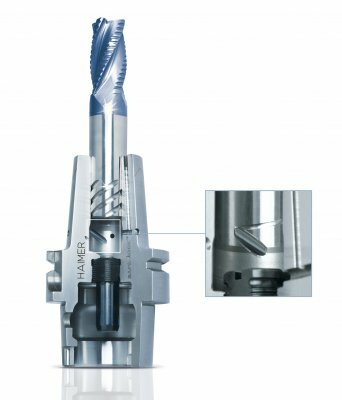 HAIMER Safe-Lock™ grooves were subsequently added on similar solid carbide tools, but the application would be run again with a reduced spindle taper interface (HSK 63 instead of HSK 100), with a less rigid 5-axis gear driven spindle and a less stable diagonally fixtured workpiece. The result: Despite these additional limiting factors, the tool was able to process a full slot of 2 x D = 50mm with complete process reliability. Werner Kirsten says: "this way we were able to indirectly prove that Safe-Lock™ works and that the shrinking technology has even more potential with HSK-A100, especially on 5-axis machining centers withgear spindles." 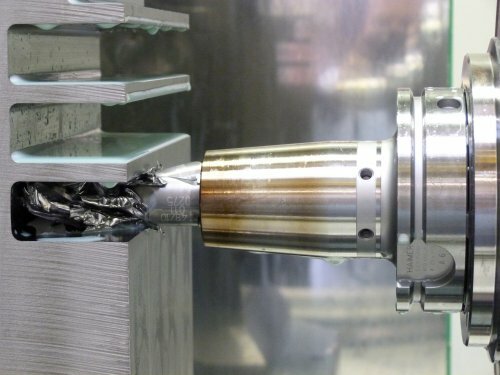 Afterwards this samplemachining on Ti-6AI-4V was carried out various times, including during the Airshow in Farnborough, whereby it was proven that the previous limit of 1 x D = 25 mm full slotting in titanium could be doubled with the use of Safe-Lock™. From the onset of its creation, HAIMER recognized the incredible potential of the Safe-Lock™ system, which is why the company created a licensing program to give innovative tool manufacturers the ability to integrate the patented pull-out protection system into their tools. 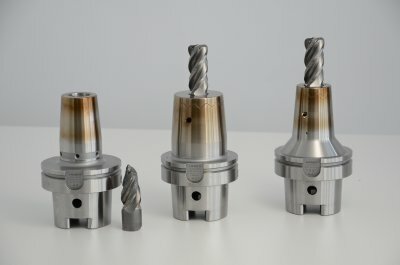 The result of their vision to create a more open system has been a tremendous success, with leading cutting tool manufacturers having now signed licensing agreements, including Walter, Widia, SandvikCoromant, Seco Tools, Sumitomo, Kennametal, Helical, Emuge Franken, Data Flute, Niagara, OSG,SGS Tools and recently Mapal. During trochoidal milling operations, where the cutting speed and axial depth of cut can be increased through software support, productivity is significantly improved. However, the increased cutter engagement and cutting forces that result from the higher cutting performance create a situation where tool-pullout can occur very easily. Prior to Safe-Lock, this problem was prevented with Weldon shanks and chucks.However customer had to sacrifice speed and accuracy due to the nature of this clamping system. A shrink fit chuck with Safe-Lock™ offers the same safety as the Weldon system, but provides the additional advantage of accuracy and balance. The ideal balancing and runout characteristics of the shrinking technology in combi-nation with the clamping safety of the Safe-Lock™ system permit greater productivity achieve through faster permissible speeds and increased tool life all with complete tool security assurance. 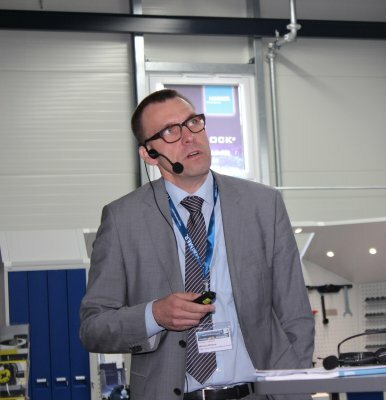 Werner Kirsten, Technology Developer at Heller: "Therefore I considerthe HAIMER Safe-Lock™ systsem a practical, easy to handle andprocessreliableadditiontotheshrinkingtechnologywhichwealready utilize, especially in connectionwithstandardizedtoolsofothermanufactures." HAIMER Heavy DutyShrink Chuck (middle) and Power Shrink Chuck (on theright) nextto a shrink fit chuckwith a standardgeometry. Bothchucks on therightcanbeequippedwiththepulloutprotectionsystem Safe-Lock™. This combinationprovideshighestrunoutaccuracy, processreliabilityandeliminates the problem of tool pullout. In order to equip tool holders withthe HAIMER Safe Lock™ system, spiral groovesaregroundintothetoolshank. In combinationwithspecialdrivekeyswithin thechuck,thesystempreventsmillingcuttersfromgettingpulled out ofthechuckduring extreme machining. The vibrationresistantshrink fit chuck HAIMER Power Shrink Chuck is also availablewith Cool Flash. Tools withoutinnercoolantsupplybenefitfromthefactthatthecoolantis in directcontactwiththecuttingedge. This results in a smoothercuttingprocess and longer tool life. Bynowleadingtoolmanufacturers such as Walter, Widia, SandvikCoromant, Seco Tools, Sumitomo, Kennametal, Helical, Emuge Franken, Data Flute, Niagara, OSG,SGS Tools andrecentlyMapal rank amongstthe HAIMER Safe-Lock™ licenseholders. These manufacturersoffertheir solidcarbidetoolswith Safe-Lock™.